Commissioners said they were not influenced by a complaint about a flier distributed by CMP in Farmington. FARMINGTON — Franklin County commissioners voted to revoke support for a proposed transmission line through western Maine on Tuesday after expressing concerns over the permitting process for New England Clean Energy Connect and hearing a complaint about a flier encouraging Farmington residents to support the project. “I know back in October we supported this (Central Maine Power) line, but I think a lot of towns are now removing that support or staying neutral,” said District 1 Commissioner Terry Brann. The plan calls for the construction of a 145-mile transmission line to deliver hydro power from Quebec to markets in Massachusetts. 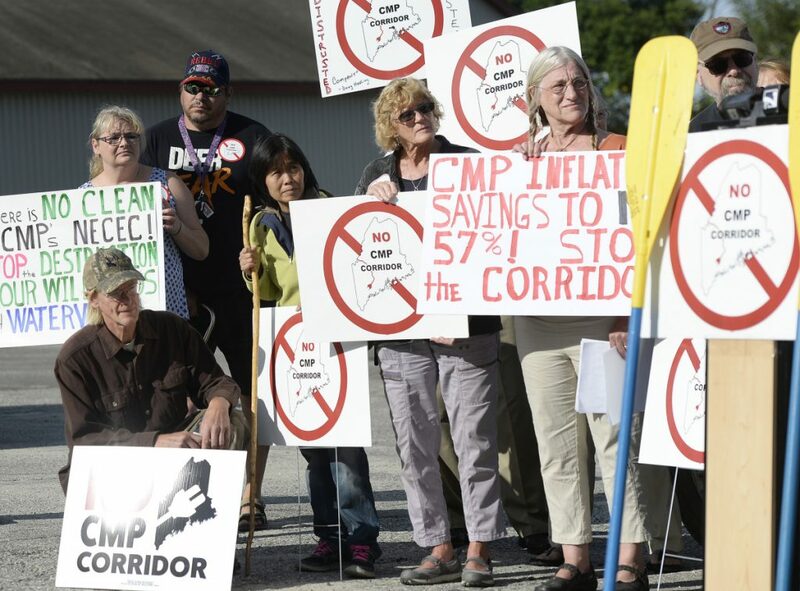 The project has been fraught with controversy since CMP won the $1 billion bid to build the line, which would cross forests and mostly undeveloped land in western Maine. District 2 Commissioner Charlie Webster and District 3 Commissioner Clyde Barker also voted to support rescinding support, making the commission the latest entity to rescind support or oppose the project. Others include Jackman, Moose River, West Forks, The Forks, Caratunk, Embden, Wilton and Alna. The decision Tuesday came after commissioners were presented with an email from the Greater Franklin Development Council in which Executive Director Charlie Woodworth said a flier recently distributed by Central Maine Power was misleading and contained a statement attributed to GFDC that it did not write. The flier, which was distributed to Farmington residents over the weekend and states it was paid for by NECEC, encourages them to vote in support of the project at the annual Town Meeting Monday. Woodworth, who was not at Tuesday’s meeting, did not respond to a phone call or email seeking comment. A letter written on GFDC letterhead by its previous executive director, Alison Hagerstrom, in July 2017 and posted on the NECEC website does contain the language used in the flier. John Carroll, a spokesman for CMP, said that letter was the source of the information on the flier. “Looking at the (email) from Mr. Woodworth, we are distressed he would take that position without even maybe taking the time to call us and ask where that quote came from, because it is in fact a quote from a letter provided by the economic development commission,” Carroll said. He also said it’s concerning commissioners may have revoked their support for the project based at least in part on Woodworth’s complaint, though Webster said later in the day Tuesday that wasn’t the case. Last month, Gov. Janet Mills threw her support behind the controversial project after CMP announced plans to offer $258 million in benefits over 40 years, including $5 million for economic development in Franklin County, $1 million in scholarships at the University of Maine at Farmington and $4 million for vocational schools, scholarships and math and science training in Franklin and Somerset counties. But Webster said it would have been preferable for CMP to offer lower rates for electricity ratepayers in Maine in exchange for the project being built. Sandra Howard, a spokeswoman for the group Say NO to NECEC, which is opposed to the project, praised commissioners’ decision in an email Tuesday. Like Webster, Brann said the flier didn’t have anything to do with his decision to revoke support. Despite some significant benefits to the area — the town of Farmington is expected to receive $436,183 in new annual tax payments from the project — Brann said he’s heard from many people who are opposed. Residents in Farmington are scheduled to vote Monday to authorize the Board of Selectmen to send a letter to the Maine Public Utilities Commission stating whether they support, don’t support or have no position on the project. So-called “intervenors” in the case, which have been approved by the Maine PUC as being directly impacted by the project, have the right to file letters or the results of votes to be considered by the agency as it makes a decision on permitting. Both the Franklin County commissioners and town of Farmington are intervenors. However, Harry Lanphear, a spokesman for the PUC, said there’s no guarantee that just because a town or other entity votes to support or not support the project that it will have the final say on whether it’s built in that community.